Welcome to Vernons Casino where you can play exciting table games such as American and European Roulette, Craps, and Baccarat. You can also find popular online slot machines such as The Incredible Hulk, Fantastic Four, Thor, and Iron Man. Have fun and win real money at Vernons Casino online. Not many online casino companies can boast a history of over 80 years. 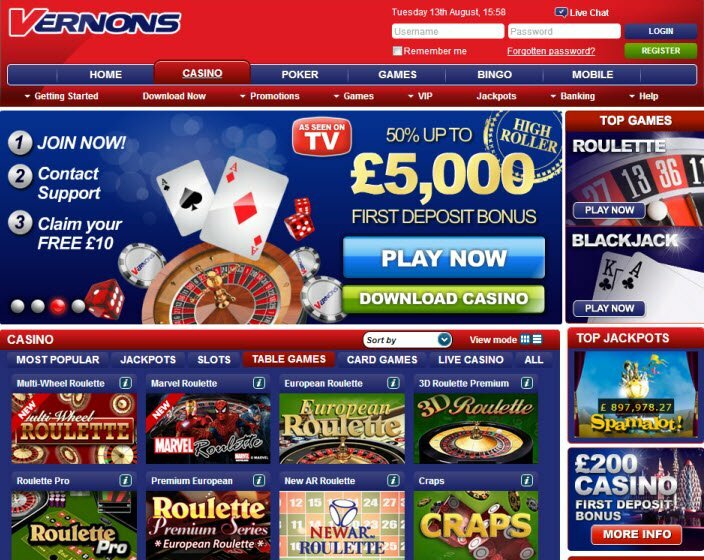 Vernons Casino started back in 1925 as a football pools coupons business. Powered by Playtech, today Vernons has expanded into internet-based casino games including hundreds of Slots, Table, Card, Arcade, and Bingo games. Games! Games! And More Games! Play Vernons Casino games for options like Slot Machines, Arcade Games, Poker, and Blackjack as well as table games like Roulette, Craps, and Baccarat. In addition, you can play popular online casino games from anywhere with Vernons Casino Mobile Games available on mobile devices including iPhones, iPads, and Android devices like HTC phones or Samsung Galaxy to name a few. Vernons Casino jackpots have your supply of the most popular progressives with cash prizes that grow with each second. Jackpot games include Iron Man, Pink Panther, Thor, Queen of the Pyramids, and X-men progressive slots. Vernons Casino also has your supply of the most popular progressive jackpots with cash prizes that grow with each second. Jackpot games include Iron Man, Pink Panther, Thor, Queen of the Pyramids, and X-men progressive slots. Vernons Casino offers so many bonus promotions that it’s difficult to keep track! Tuesdays and Wednesdays both have special daily bonuses known as Tues No Lose Day and Win win Wednesday respectively. Be sure to check out The Game of the Month at Vernons Casino in which players can receive bonuses such as comp points to redeem real money. Be sure browse their website to find out the ever-evolving list of Vernons Casino bonus promotions because there’s plenty more where that came from! 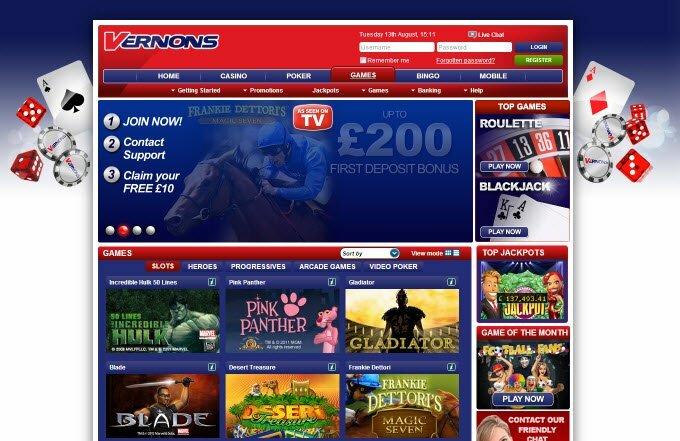 Vernons Casino is fully licensed and regulated, guaranteeing safe and secure banking. Although other online casinos may boast a larger list of choice, Vernons Casino still accepts a number of reliable banking services. Options for instant payment include Visa, MasterCard, Maestro, Neteller, Skrill, Bank Transfer, Ukash, Giropay, Ukash, Giropay, Sofort, and iDEAL. 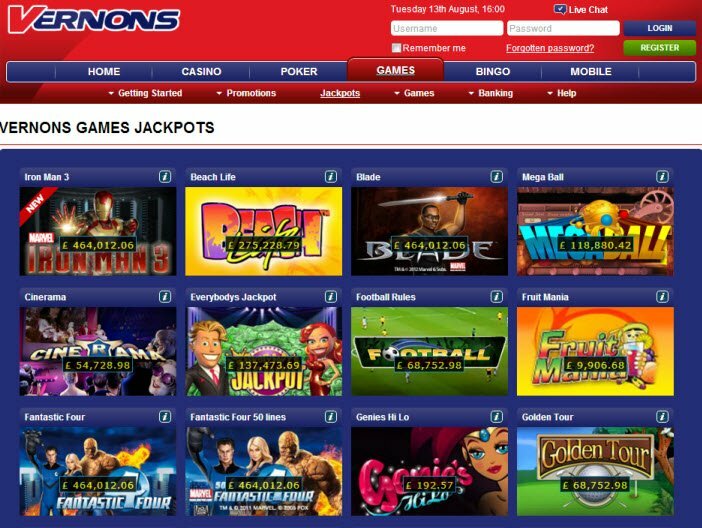 Vernons Casino provides customer support directly from their Live Chat hotline. They also offer toll free customer service via telephone and fax to players in the United Kingdom. However, Vernons Casino does not provide free phone service to those calling from outside of the UK. Those with inquiries can check out their database of information available on the casino website. They also ask that customers direct specific questions regarding deposits, payouts, and more to specific email addresses. Play Prestige Casino for Prestigious Jackpots! I prefer playing with my cell phone. Will this casino work on my iphone? Yes – Vernons Casino has a mobile version available on iPhones, iPads, and Android devices.